Clement F Mooney (B.Com, CPA, MBA) spent 35 years splitting his time between his office in South Melbourne and Trentham (Victoria). 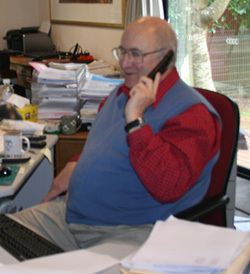 He now works exclusively from his Trentham office, which was relocated on April Fools Day 2010. It has been a wonderful move and his clients have enjoyed visiting him in his new country setting. In his spare time he enjoys riding his black Suzuki GSX1400.